Chrysanth (Chrysanthemum): growing, planting, caring. One of the most popular flowers in November! 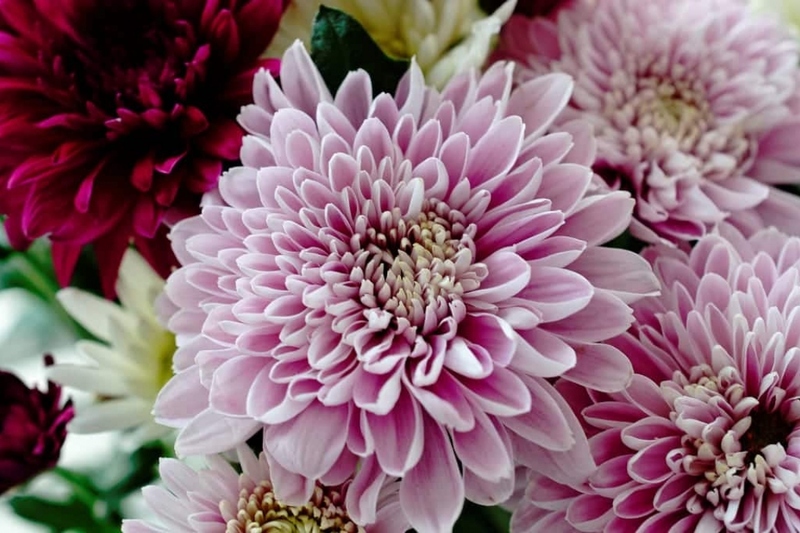 Chrysanthemums - chrysanths - are flowering plants of the genus Chrysanthemum in the family Asteraceae native to Asia and northeastern Europe, and one of the prettiest perennials that start blooming early in the autumn. Wild Chrysanthemum taxa are herbaceous perennial plants or subshrubs with alternately arranged leaves divided into leaflets with toothed or occasionally smooth edges, and compound inflorescences composed of several yellow flower heads, or sometimes a solitary head. Modern cultivars are showier than their wild relatives. The flower heads can be daisy-like or decorative, like pompons or buttons. In addition to the traditional yellow, other colors are available, such as white, purple, and red. The chrysanth have many habits and flowering colors: they are classified according to the shape of their flowers, which can be simple, curved, in the shape of anemone, in pompon, spatulate, or spider shaped ... There are also early varieties that bloom in September and late blooming until January. Plant chrysanth in fall or spring. They will enjoy a sunny, sheltered, cool and drained, neutral or acidic, rather rich location. Add compost before planting if necessary. Mulch just after planting, and water. Chrysanthemums, once installed - and especially properly mulched! - do not have large water requirements. In pot however, water during the summer season but without excess, once a week if it is very dry, rather in the morning and sparing the leaves. The first year however, watch the weather, and bring some water if necessary. These chrysanthemums are multiplied by cuttings between January and March. Choose a beautiful stem from which you will remove the foliage only keeping two to three pretty leaves, place it in sand and compost well decomposed. Keep it between 16 and 18 ° C. A month later, you should be able to repot the seedlings in a cold shelter. Mulch if possible your chrysanth, even in pots! This will prevent you from watering and weeding in summer and it will protect the roots from cold in winter. When stems reach 15-20 cm, trim the most vigorous plants to keep them compact. Repeat the process in the summer, to get a larger number of small flowers. These chrysanthemums are afraid of frost, bring the best tufts in a cold greenhouse during the winter in regions with harsh winters. In Spring, after the frosts, put your chrysanth back in the open soil.